Der Artikel Welte-Mignon Mystery Vol.9 - Camille Saint-Saens wurde in den Warenkorb gelegt. 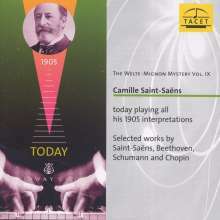 Camille Saint-Saëns was a man of exceptionally wide-ranging talents, a truly universal genius. Yet as a poet, dramatist, philosopher, astronomer, biologist, archaelogist, ethnologist, artist and caricaturist, and even as a pianist, he is completely forgotten; indeed even as a composer he went through a period of neglect. Yet the piano was his constant companion in a matchless career lasting more than three-quarters of a century, from his beginnings as a child prodigy to the last day of his life.